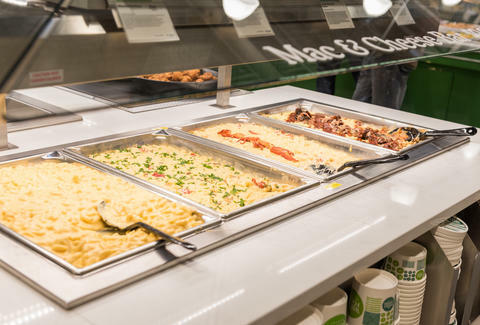 Although recent reports suggest Amazon's slew of price cuts at Whole Foods may not be as good as they seem, it looks like the organic grocery empire has devised a new way to lure you into its stores: a dedicated mac & cheese bar. Say goodbye to all of your money. A new Whole Foods location at Denver's Union Station will be the among the first to feature the cheesy carb wonderland when it opens on November 15, according to a report by The Denver Post. Think Whole Foods' standard self-serve hot counters, or "hot bars," but loaded with nothing but several different kinds of mac & cheese. OK, don't think about it too much. You might get hungry, and maybe a little jealous. The mac & cheese bar will span about 6 feet and feature several different kinds of mac & cheese, including roasted tomato, pulled pork, vegan, and of course, the good ol' basic kind. But with the store's other prepared food options, the custom mac & cheese flavor possibilities are wonderfully -- if not alarmingly -- endless. You may find yourself eating a $10 takeout bowl full of fried chicken mac & cheese someday. Or maybe some vegan mac & cheese loaded with kale from the salad bar, if you want to pretend you're in Brooklyn. 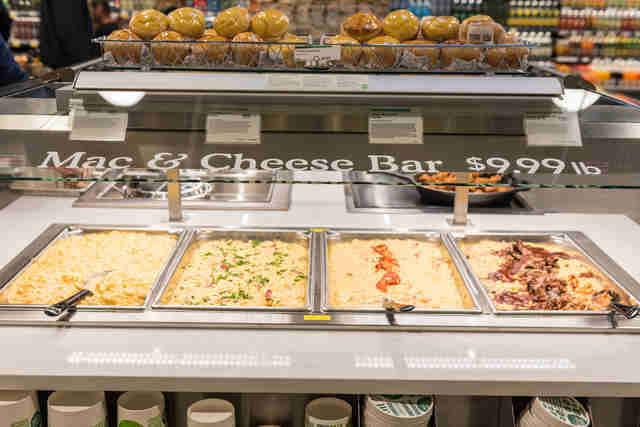 So far, Whole Foods has yet to say if it plans to add mac & cheese bars to other stores across the country, but seeing as it has already rolled out such things as a self-serve mochi bar and a produce butcher in recent months, it wouldn't be too surprising. In the meantime, best of luck setting a mac & cheese budget. Tony Merevick is Senior News Editor at Thrillist and hasn't had mac & cheese in an embarrassingly long time. Send news tips to news@thrillist.com and follow him on Twitter @tonymerevick.